Wanting to do something unusual in Italy? With crystal clear waters and panoramic views, this place offers a tranquil atmosphere to those who love spending time away from the crowd. The sandy beach offers a natural playground for kids to engage in some recreational and creative activities. Snorkeling is the most popular activity here. If you love to swim, do try this in the azure water near the beach. Most importantly, bring your camera here to click the best pictures of your life! Want to plan a DIY trip? Use Tortoli trip planner for the same. Fine Accommodation options like Hotel Antica Posada, Marie Claire Lanusei and Domus De Janas Sul Mare will meet your requirement of where to stay in Tortoli. Find out how to reach Tortoli to begin with. Plenty of wholesome Tortoli vacation packages are available to choose from, pick your today! Love this? Explore the entire list of places to visit in Tortolì before you plan your trip. Fancy a good night's sleep after a tiring day? 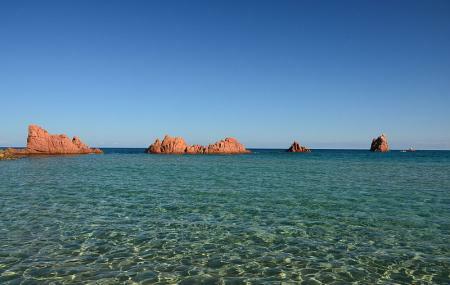 Check out where to stay in Tortolì and book an accommodation of your choice. Nice Beach area. Incredibly clean a water. Great place to snoorkeling around red rocks. Impressive view from the rocks. Nice location for swimming and diving, crystal clear water.